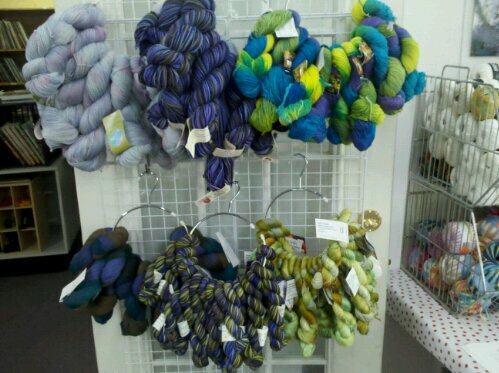 Now available at the shop are the limited edition “Yarns on Stage” (photos). These are 1 one of a kind hand dyed sock yarns from: Twisted Sisters, Great Adirondack, Dream in color, Claudia Hand Paints, Prism, Conjoined CreaTions, Pico Accuardi, Alpaca with a Twist and Shiibui. These are special colors that were created just for this project! There are still some spaces left for the Fall In Store Retreat. Call the shop so we will have a goodie bag for you! If you want a meal, you need to let us know right away. Don’t forget to bring in your Brest Cancer Scarf for your $10 credit. We will pass them on to the cancer unit in Judy Morris’s name. Next overnighter is dec 4. The good times start and 7:30 and go as long as you want to stay. 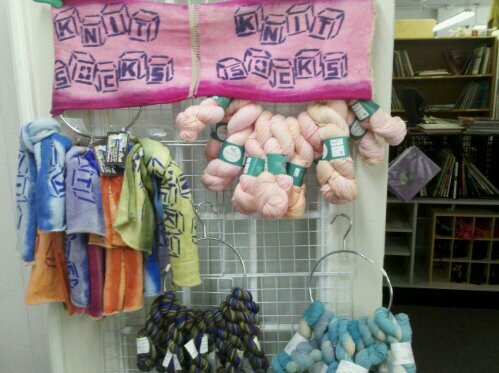 Remember that the info meeting for the March 2011 Knitting cruise is Wed. Oct 20 at 6:00pm at the shop. Those who have signed up, or are thinking of coming with us should attend. Jane and I have picked a couple pre- cruise projects and we will discuss project to do while on the cruise. We will also tallk about flights and hotels. Join us for the fun!